If you switched to diet soda hoping to avoid refined sugar, or any other fizzy drink or aspartame-sweetened food, you are now guzzling down a product created by one of the GM Giants – Monsanto. Many scientists are calling for further study of a genetically modified bacteria which is used to create aspartame, but the evidence is already quite glaring, that the stuff is no good. Interestingly, aspartame is made using genetically modified bacteria in the US, but according to a Monsanto source, the UK market does not have to eat genetically modified bacteria poop. Some consumer groups warn; however, that some low-calorie foods may still contain the GMO aspartame, even overseas. GM aspartame may cause blindness, cancer, and brain tumors. Aspartame is made by combining phenylalanine, a substance that is produced naturally by bacteria with another amino acid that has not been genetically altered. However, Monsanto has genetically changed the bacteria to create more phenylalanine. When this amino acid chain breaks down, it breaks down into three constituents, including methanol – which has been linked to autism, preterm delivery, and more. This is then broken down in the body to formic acid (which needs to be handled with goggles and gloves in a lab), and formaldehyde (something used to clean drains and embalm dead bodies, and a known carcinogen). It also breaks down into a chemical called DKP, which can cause brain tumors according to a study published on the US Food and Drug Administration’s (FDA) site about aspartame. It seems Coca-Cola, Pepsi, and Monsanto are doing a great job with adding toxic ingredients to our beverages. I know of not a single toxicologist who agrees with this webpage. The entire folate vitamin system requires methanol’s oxidation products formaldehyde and formic acid to function. Or putting it another way, dose alone makes for toxicity. 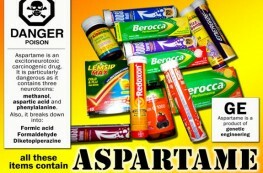 Aspartame’s methanol dose is innocuous! does not cite tomatoes to be as dangerous as aspartame. because it sounds smart does not mean it is right. I am not an scientist therefore I know very little of what you (all comments) are saying, still I agree with you that you SHOULD NOT believe everything you read in many cases (including this article, other articles, even history) many times things/stories are deformed or invented. The emotional impact the author was striving for is significantly lessened by the large numer of errors in grammar and syntax. oh my god. why am i not surprised. nothing is surprising anymore 🙁 they’re just constantly trying to kill us, just in their own selfish efforts to make money and get their products sold. I hope they get exposed and that everyone finds out what these scums are doing behind the scenes! F*ck Monsanto!